Plastic Filter Housings have been designed for use on a wide range of chemical & liquid applications within the processing industry. There are three size options of length for standard cartridges of 65 mm OD i.e. 125mm, 250mm & 500 mm. PP filter moulded housing in attractive rate, more quantity more attractive price, manufacturer of PP moulded filter housing, PP housing, PP bag housing, PP cartridge housing, PP transparent housing, filter housing in plastic, plastic filter housing. Standard Single Housings in PP, SAN, SS from 10 to 40 – both for slim & jumbo cartridges. 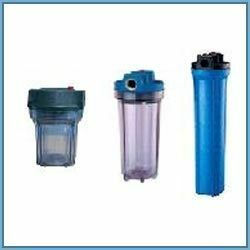 Being a well-established organization, we are engaged in offering a distinguished range of Polypropylene Filter Housing. We have reached the pinnacle of success and earned a reputed name by trading high quality range of PP Filter Cartridge Housing. We are offering a wide range of PP Filter Housing. Bag Length: 10 Inch, 20 Inch, Etc. - Widely used in residential, Commercial & Industrial applications. - Reinforced walls for increased strength. 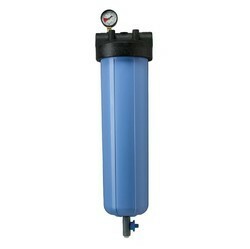 - Sizes in 10" &20" both slimline/jumbo for various flow rate. - Available in opaque & clear bowl. - 1/2" & 3/4" inlet/outlet connection max temp 36 deg c & upto 4 kg.